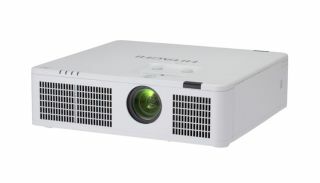 The What: Hitachi America has launched the LP-WU3500, 3,500 lumen LED projector. In addition to high brightness and clarity, the LP-WU3500 is engineered for low total cost and low-maintenance ownership, with an expected 20,000 hours of life. The What Else: The High Lumen Density (HLD) technology works by channeling blue LED light through a phosphor rod, where it is discharged as bright green light. Working in tandem with high-brightness red and blue LED lights, it achieves maximum brightness and a 30,000:1 contrast ratio. LED technology delivers enhanced image quality with a wider color gamut, which results in increased picture quality. The Bottom Line: The LP-WU3500 operates at a low noise level, making it well suited for presentations and environments such as classrooms, conference rooms, art galleries, museums and digital signage. The dust-resistant structure applied to the optical engine reduces the effect of dust and particles in the air and enables the projector to be used in an array of environments without overheating and creating unnecessary noise.